We made a manger tonight, and wrapped our baby tight, with stuffed animals looking on. Christmas Countdown Day 15 focused on the manger. The Son of God’s first baby bed was a feeding trough. In order to help us imagine sweet Baby Jesus’ head laying down in the manger, we recreated the scene. We built a manger out of a woven basket, and added yellow tissue paper like straw. Animals, such as our stuffed Tigger, moose and several sheep, gathered around the manger. Lauren pretended to be Mary and Jackson was Joseph, and we wrapped a baby doll in a towel, just like Jesus was wrapped in strips of cloth. Both Lauren and Jackson took turns holding and rocking the baby Jesus. 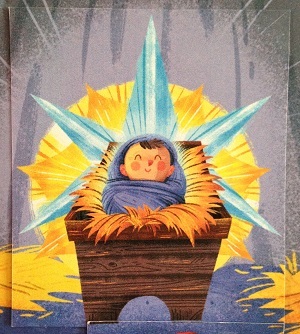 Then, we placed the baby gently in our manger. We wondered if any animals tickled Jesus’ toes trying to get a snack of hay. Would the straw have been itchy? As we prayed, we thanked God for watching over Jesus as he lay in his first crib the night he was born, and for coming in such a humble way to show He was for all people.